Kindred Canine is a dog walking & pet sitting business serving the western Denver Metro area of Colorado since 2014. We are a Force-Free, Positive Reinforcement pet care company with a passion for the humane care of your pets! 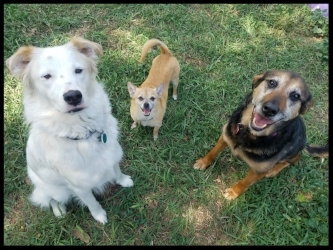 We offer regular dog walk and pet sitting services customized to your pet's needs! Philosophically, we are aligned with the position statements of the Pet Professional Guild and have taken a force-free pledge to never use harsh or aversive handling methods with your pets. We support evidence-based and scientifically researched methods of training, and trainers such as Emily Larlham, Pat Miller, Dr. Ian Dunbar, and Patricia McConnell, among others. We love walking dogs on ergonomic harnesses! Learn about our favorites at the Whole Dog Journal, here. Due to our force-free pledge, we are happy to walk pets wearing buckle collars or harnesses, but prefer not to walk dogs with aversive training tools such as prong or e-collars (feel free to ask us why and we'll send you some scientific articles!). I’m Hayley, the owner/operator of Kindred Canine. Having grown up with pets (dogs, cats, bunnies, chickens, ducks, rodents!) my entire life, caring for them is second nature for me. I was the kid bringing home strays and saving wildlife. I decided to get serious about my love of animals and obtained a certification through Penn Foster Career College as a Dog Obedience Trainer/Instructor in May of 2008. I’m certified by the American Red Cross (2002) and PetTech (2014) in Pet First Aid & CPR, and more recently, I completed a bachelor degree in Biology from Metropolitan State University of Denver (2016). In 2008, I started conducting private dog training sessions under the name Kindred Canine. The name (and logo) were inspired by my first little red dog, Brandy, who was my best friend through elementary and high school. I also became the lead dog trainer for the CHAMPS program at MaxFund No-Kill Animal Adoption Center in Denver from 2009-2013. By 2012 pet sitting and dog walking had become a legitimate side job while I toiled away at my full time job at Natural Grocers, until pet sitting became a full-fledged career in 2013 when I started working full time for Delightful Doggies, before rebranding Kindred Canine and jumping into the world of running a small business!